I was fortunate to be introduced to off-road vehicles at a very young age by my father. My father rode motorcycles on the street and the dirt, as well as snowmobiles during the winter. Growing up in the San Francisco bay area (city) my parents would make the trip 3 hours north to Paradise Ca. where my grandparents lived on a large property. At only a few months old, my parents would stuff me between the two of them on a snowmobile and go out on the trails in the winter. During the summer my dad would ride me around on his dirt bike and/or his Honda Odyssey. By the time I reached about 3 years old, I learned how to ride on an ATC 90 around the property. When I was about 5 I got my first dirt bike, a 1979 Yamaha GT80. Growing up I’ve always looked forward to the weekends, that was when I got to ride on my grandparents’ land! I may have been too young to walk to the store by myself where I lived, but those weekends I was free to explore the land on my dirt bike by myself (as long as I stay within the property boundaries haha). I remember making courses around the trees and would include any cool obstacle I could find. Whether it was a fallen tree or off camber hillside, using trees to corner around, berms would build up quite regularly each weekend. My dad would come find me to check up on me. He would always tell me I needed to slow down because I could lose control and crash into a tree. I had a couple of other bikes after that first one, but it wasn’t till 1993 when I would get my first full MX bike. I was 15 at the time and Super Cross star “Showtime” Jeremy Mcgrath was the hottest rider and Honda was the bike to have, so my dad bought me a 1991 Honda CR250. I probably should have been riding a CR125 like all my other friends but I was on a 250. I had nothing but bad luck on this bike. Multiple crashes, broken bones, and I started getting majorly discouraged as I watched all my friends excelling further than me on smaller 125s. Here is where you may get totally shocked on my riding history; in 1995 my dad decided to head to the Oregon dunes for Sandfest. At the time my dad had a mod’ed Honda 300ex quad, and there was an MX race for quads at Sandfest. He asked if I wanted to enter and I jumped at the opportunity. Well, I shocked myself AND my dad when I lead most of the race in both moto’s and ended up finishing 3rd overall. At the time I felt more at home on the quad, more than my dirt bike, so I convinced my dad to sell my dirtbike and buy me a 1986 Honda 250r. I would go on to start my MX racing mounted on a quad for a handful of years, traveling throughout California and entering any series that had a quad class. I would also add to my racing schedule a series of Quad Wars events, put on as part of the Monster Truck circuit. These races took me beyond California into Nevada, Oregon, and Washington. Everything came to a complete stop when I was 25 after I started having major back issues as I started making my way down the road of starting a family when I met my now wife, Andrea. The decision was made to sell everything and stop riding. It would only be 4 years before I couldn’t take it any longer and picked up a dirt bike to see how my back would take the abuse. After a few months of riding, I felt great to be back on a bike and upgraded to a crf450x to explore more trails in the northern ca. area. A big life change came in 2014 with relocating my wife, 2 daughters, and son to Bakersfield Ca. I knew already that moving further south would open up many riding opportunities, and with my son already showing a huge interest in dirt bikes, this would be great for both of us. I had nothing but the goal to do big, long distance day rides and challenge myself with all the terrain that southern ca. offered. After doing extensive research, I found tons of organized rides along with many social media groups that rode, but many of these types of rides had large amounts of miles traveled that would connect tracks with highway roads. I would quickly sell my Honda 450x and replace it with a plated highway legal dirt bike. My current machine of choice, which is by far my favorite, is the 2015 KTM 500exc. This bike does it all for me. Plenty of power and speed in the desert while being that happy middle of a nimble single track workhorse. My upgrades of choice, or “Must Haves”, include Seat Concepts Comfort Seat, Scotts Steering Dampner, Highway Dirt Bikes hand guards w/Mirrors and bar risers, Baja Designs XL Pro LED light kit and I love running Maxxis Desert IT’s! I first found the WLF crew on social media in my search for groups to hook up with to ride. I sent DM’s and commented on their posts to be recognized in hopes to get invited to one of their group rides. The day came when they posted about a Big Bear ride that would be open to a selective few riders that required an online application. I still remember laughing at one point when I came to one particular question … It went something like “select the type of rider you best reflect”. I had to choose one of the provided options. Options A & B were “a standard beginner” and then “advanced levels of riding” but option C was “Graham Jarvis” lol. Needless to say, I selected “B”. That first ride I was nervous and wanted to prove I could hang. I held my own for the most part, but I definitely needed to step my game up to hang with these dudes. I must say these guys are probably the most modest group of guys that act like family, you may even think most of them are related. I guess I wasn’t all that bad because they invited me out countless times after that first ride. I have appreciated them opening up their group and treating me like family. In the recent couple years, I have participated in a handful of organized dual sport events. One event that I feel privileged to say I accomplished, was the completion of the 2016 Big Bear Trail Riders Hard Route that was 225 miles of aggressive terrain. It was said that 157 riders signed up and started the Hard route, and only 47 finished. I, along with 4 others that made up our 5 man team, finished. Another event that was a blast was the 2016 LAB2V. Although we had multiple setbacks, it was a great honor to ride with fellow rider Nick Livingston, aka @RODEO.COWBOY. He traveled all the way from Missouri to ride along with Luke, Brandon, Garrett, and myself. AKA Lil Nick was introduced to motorized vehicles at just a few months old when my wife and I took him and our daughters on his first camping trip to Glamis Dunes. His first dirtbike was a PW50 that I brought home before he could walk. He would want to sit on his bike all the time and pretend he was riding it. At the age of 3, he started riding on his own. We would head out to our local riding areas where he would go riding around on his own and then I’d put him in front of me on my dirt bike and we would ride trails together. Looking back to his early years, he’s always had an interest in anything that had to do with dirt bikes. From his toys to watching movies and races on TV, it’s all just come to him naturally. I have tried my best never to push him, but rather to be as supportive as I can. As he grew through the smaller bikes, I have always tried to have that next size available before he was ready to move up. That has paid off as he jumped from a PW50 to a KTM 50 mini, and up to a KTM 50 sx pretty fast. It was very exciting as a father to have my 4.5-year-old riding Hollister Hills trails with me and being on a taller bike that he couldn’t even hold up on his own. The look on other riders face’s when I stopped at the trailhead and here comes Lil Nick riding up to me so I could grab his handlebars so he wouldn’t fall over … priceless! I said over and over again I was not going to let my son race dirt bikes, I guess because I never wanted to get my hopes up to expect him to love it as much as I did growing up. Well, after much debate and watching how well he had been excelling, my wife and I entered him in his first race at the age of 6. He would finish 2nd in that first race and, naturally, he was hooked on it. Not going to lie, I was hooked on watching him and his excitement at the race! I caved in and the racing started. Lil Nick would go on to race in many of the series in the southern California area for the 2015 season. 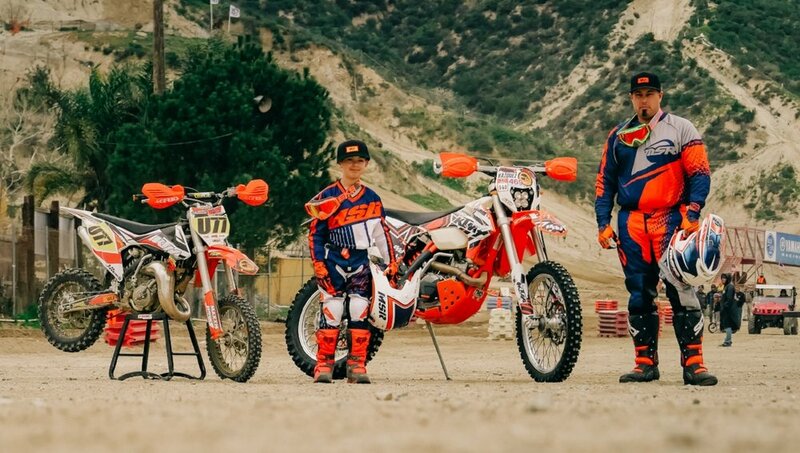 In addition to MX racing, we spend many weekends camping and riding in the desert, this developed into the desire for more technical and longer distance riding. In 2016 we added the Big6 Series to Nick’s race schedule. Big6 was a mix between MX and long distance that was a Grand Prix event. Bouncing between misc. MX series and the Big6 series, Nick finished out the 2016 season with some great battles and finishes. Most of all, he met and became good friends with many other racers within his class, and we spend a ton of great father and son time on the road. Although there has been a lot of racing don’t let that fool you, Lil Nick is happy to shred some desert terrain in search of finding obstacles that challenge him. 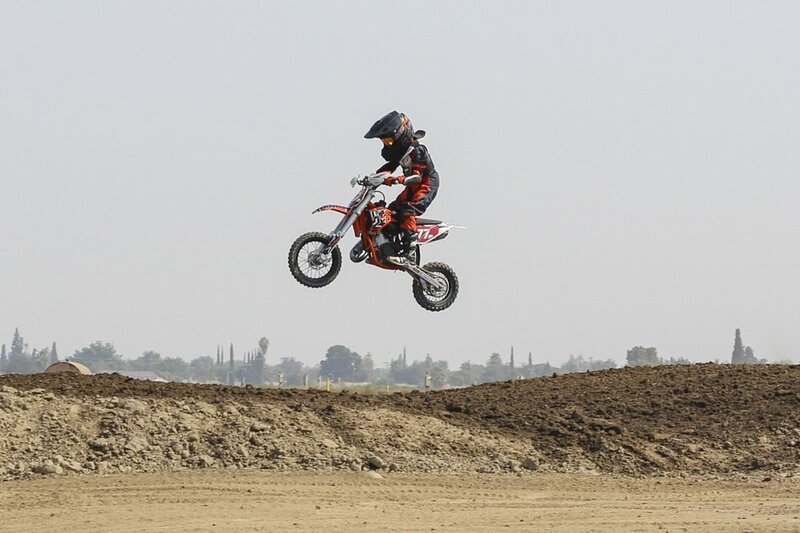 For 2017 Lil Nick will be finishing out his AMA 8yo age class on his KTM 50sx through the MX and Big6 series. The addition of a KTM 65cc bike was made for the desert and woods free riding, along with adding a 2nd class to the Big6 series. Goals are to be a well-rounded rider that can adjust to almost any terrain and be able to be included on some big boy rides. Don’t forget keeping an eye out for him at the Las Vegas Supercross in the KTM Jr SX Challenge that he hopes to be selected to race in. Chasing @lilnickv77 around for the camera today. Can't wait for something very cool to be coming out very soon 🙌🏽. 'Nick V.' has been a big part of the WLF family ever since the first time we hit the dirt. He's one of those riders that you want in your group. Experienced, talented and more than willing to help his fellow rider get through the tough obstacles. Nick leads by example from his family to his attitude on the trail. Both Nick and Lil Nick have been a huge part in growing the WLF community around Southern California. We're looking forward to more adventures with Nick and Lil Nick coming up the ranks to help lead the pack down the road. Thanks for all your support Nick & Nick! !